3 Things You need to know about Workamping! We trademarked the word “Workamper” back in 1987. Workamping is accomplished by individuals that travel the country and work. Some people try to limit the definition by saying, “Well, I’m only a Workamper if I’m working in a campground or if I live in an RV.” That’s not technically the definition. 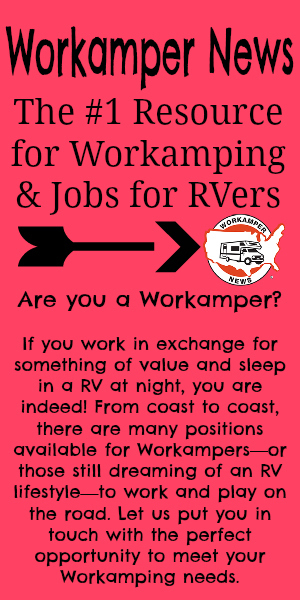 If you are living and traveling, (which usually means in an RV) and you are doing any kind of part-time or full-time work – you are a Workamper! #2: What type of work is available for a Workamper? Workamping is most enjoyable from the standpoint of what type of work is available that a person could do and actually enjoy. While the majority of the operations that utilize Workampers are in fact campgrounds, there’s really a vast assortment of opportunities available for someone who is able to think outside the box. From amusement parks, retail shops, fulfillment centers, restaurants, lodges, water parks, shooting ranges, state and county parks, U.S. Forest Service and Fish & Wildlife Service, Christmas tree stands, blueberry farms, campground map ad sales, and more- the jobs available for travelers who are willing to relocate to different areas of the country and take on jobs of all types, are endless in supply! We’ve provided SAMPLE JOB LISTINGS for more examples of ads we’ve run, from employers offering all types of opportunities for those who wish to work while they travel! Active Workampers work for large companies, for small, mom-and-pop operations – and everything in-between! #3: How much income can I earn?